In India, Mughlai, Awadhi and Hyderabadi are the popular variants of kababs, though almost every region in North and East India have their own preparations. 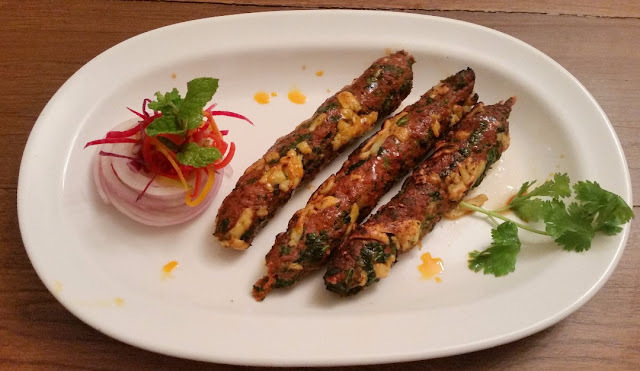 Kababs from Rampur are distinctively different from Lucknow which is not very far away, whereas the Bihari kathi kababs are popular in Eastern India. Towards Pakistan and North-East Frontier, the kababs use very little spices and has much meatier flavours. A place called Namak Mandi in Peshawar, for example, has unique kababs which only use rock salt as seasoning. Here in Awadh, stories of the tunday kababi and how kakori kababs came into being, add another interesting angle to the story of kababs. Kebab Stories here in Hyderabad is a restaurant in Hyderabad which tries to tell these stories. As is well-known, Zaiqa-E-Ramzan was a hugely popular food court set up during the Holy month of Ramzan by Food Crafters. 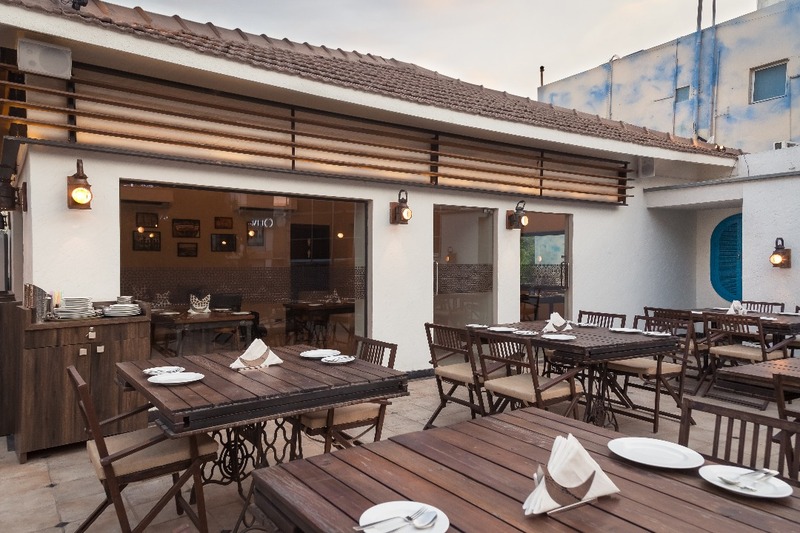 The same group has started Zaiqa-E-Hyderabad (Read here: Zaiqa-E-Hyderabad, a family destination for Hyderabadi food) in Banjara Hills which has become a sought after restaurant in just a few months. And now they have come up with Kebab Stories, a new restaurant in the first floor of the same building specialising on just kababs. 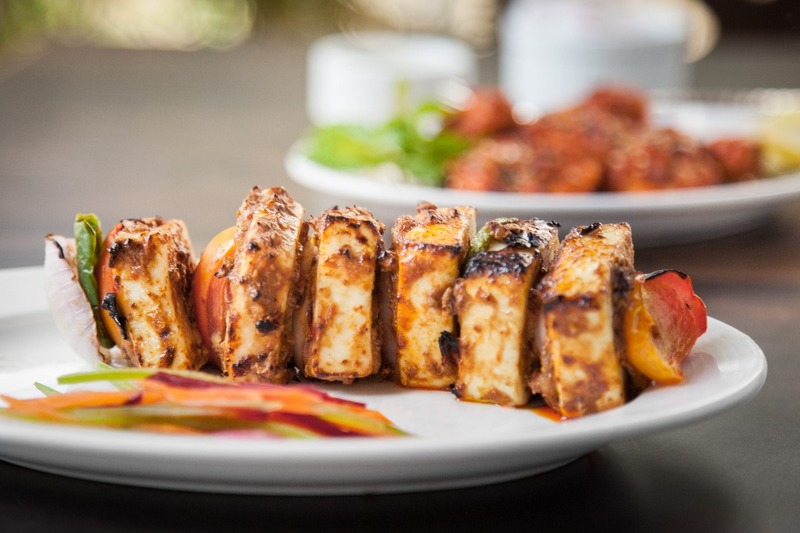 Kebab Stories have been conceived by the well-respected Chef Pradeep Khosla, the CEO of the group. A few years back he visited Afghanistan and Pakistan extensively with Nawab Mehboob Alam Khan, the food connoisseur from Hyderabad. During his trip, he had interacted closely with the chefs and studied in detail, the nuances and variations of kabab preparations in the different regions of Afghanistan and United Punjab, and has now put together a menu of the best dishes from these areas. What makes Kebab Stories unique is the fact that the recipes have been kept as authentic as possible and a lot of attention has been paid to sourcing the original ingredients. We started with Mutton Shifta Kabab, the Middle-Eastern version of seekh kabab, with mutton, cheese, and spinach. With very little spices and a hint of saffron, the flavour of mutton dominated, but on tasting the cheese worked very well to complement the experience. A vegetarian dish, Cheese Aur Paneer Ka Seekh had a combo of cottage cheese with English cheese. The dish looked colourful with green chillies, coriander and herbs, and was absolutely melt-in-the-mouth. 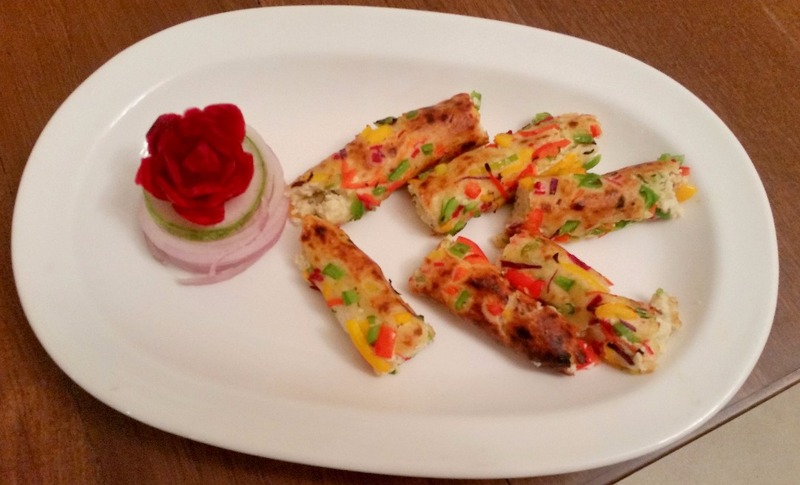 It was heartening to see that a lot of effort has gone into the vegetarian dishes in the menu. The other paneer kabab showcased was chunky Jwala Paneer Anari, which leaves a nice aftertaste of pomegranate. 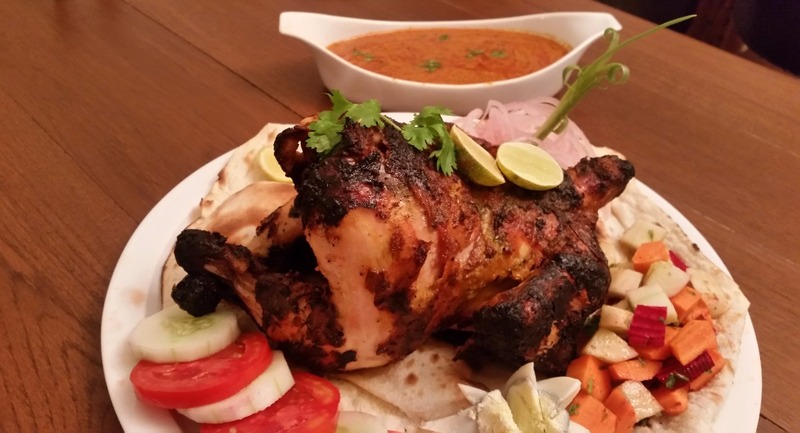 Murgh Chaap Bemisal was an offering from the tandoor menu. The slow-cooked chicken breast in the curd based marinade was stuffed with soft cheese and nuts. This was one of the best among a bouquet of good dishes for me. North-West Frontier cuisine is known for chicken sajji, and Murgh Kandahari here reminded me of that. The roasted chicken with minimal spices was complemented well by Chef’s special sauce, a cashew based gravy which tasted divine. 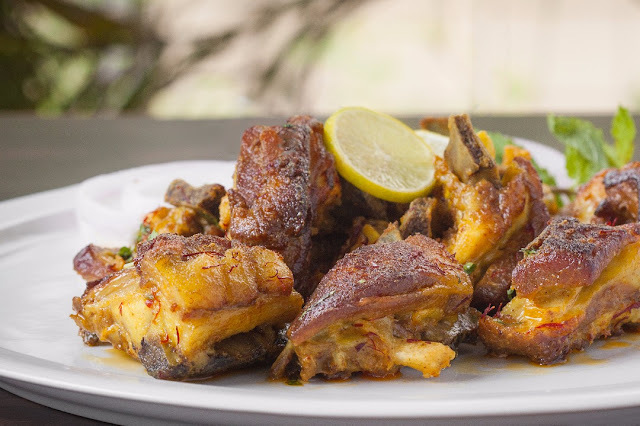 A challenge with any whole chicken dish is that the marinade does not reach the interiors, here as you dig into the dish, you can douse the meat in the special sauce to supplement the taste. The signature dish of this restaurant has to be the Raan-E-Zaiqa. The Peshawari preparation is a whole lamb leg with very little spices, which is slow cooked to perfection. You can opt for a slightly wetter version of dish tossed with bell pepper but I would advise food lovers to stick to the original preparation. A khus khus based gravy served with it is quite delicious. 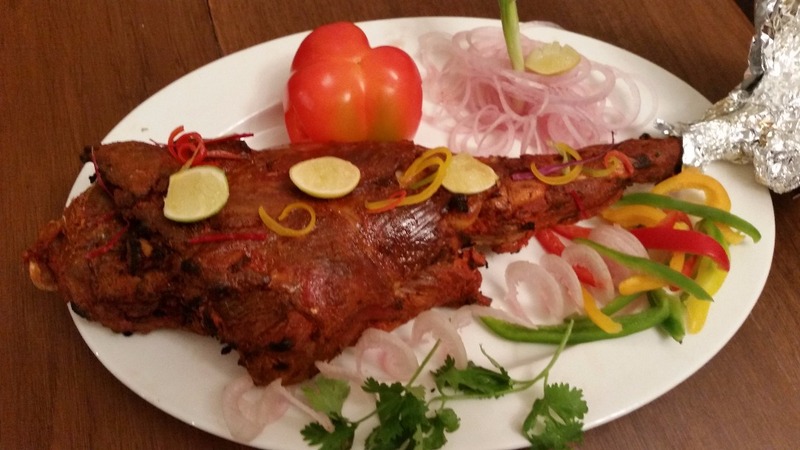 Chef Khosla told us that on a prior order they can also prepare a whole lamb. The dish is called Dum Dumba and it is served with biryani rice rich is nuts as well as a rich gravy. I love bheja, and the Bheja Sabut was perfect for me. The lamb brain is shallow fried in this preparation. You also have the option of Bheja Masala, where it is cooked in tomato and onion gravy. Tabak Maaz and kabargah are lamb rib preparations from Kashmir. 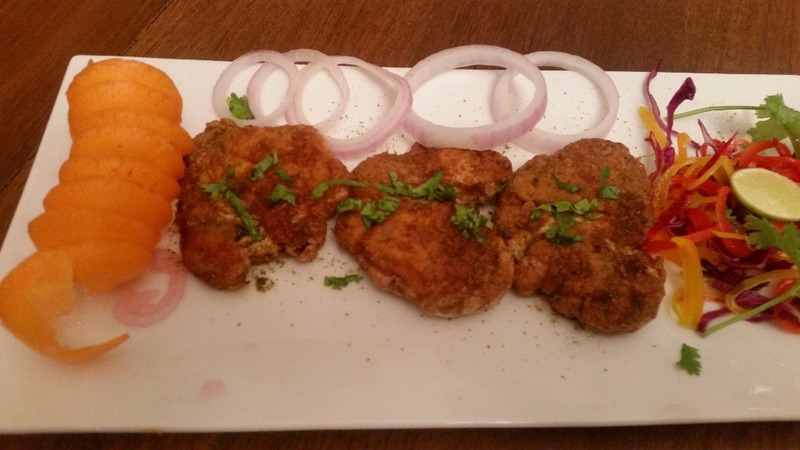 Kabab Stories has Rampuri Seena, a similar ghee-fried preparation from the royal cuisine of Rampur. Again a dish which retains the flavour of the good meat. 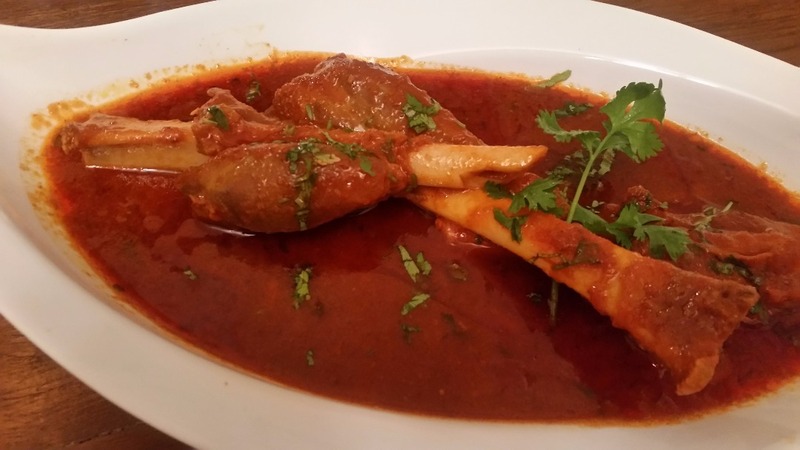 Rogani Bhuni Nalli (overnight cooked lamb shank) had a very nice gravy though the meat seemed a bit underdone to me. 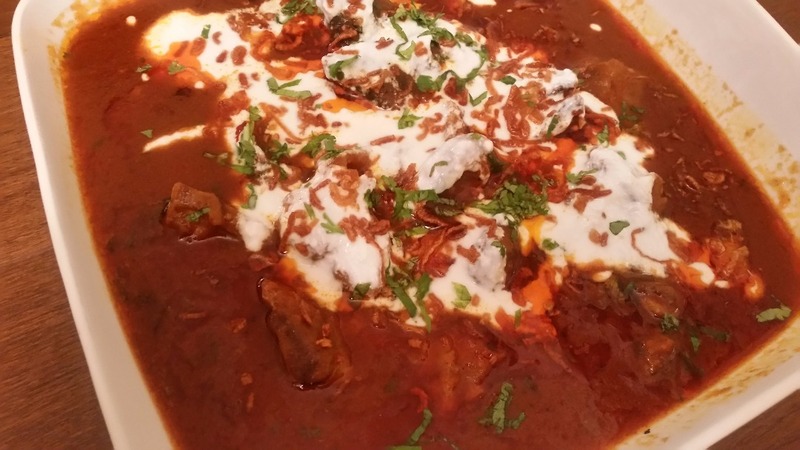 Dahi Waale Paya, where the trotters in a spicy gravy are topped by curd really stood out among the main courses. This was a Hyderabadi preparation, and the menu also incorporates some more of local food. Among the main courses, Lahori Kachhe Gosht Ki Kadhai is a special recipe from the well-known Gawalmandi food street in Lahore, which is a must visit for any food lovers travelling to Pakistan. It was a rich tomato based gravy which went well with butter naan. There were quite a few items for vegetarians too in the main courses. 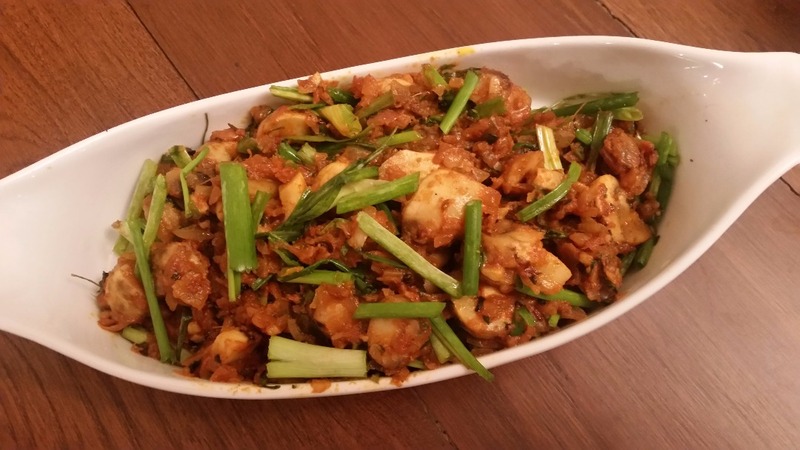 Pyaazi Kumbh Masala, a mushroom and onion preparation deserves mention here. The dessert menu is short and sweet. 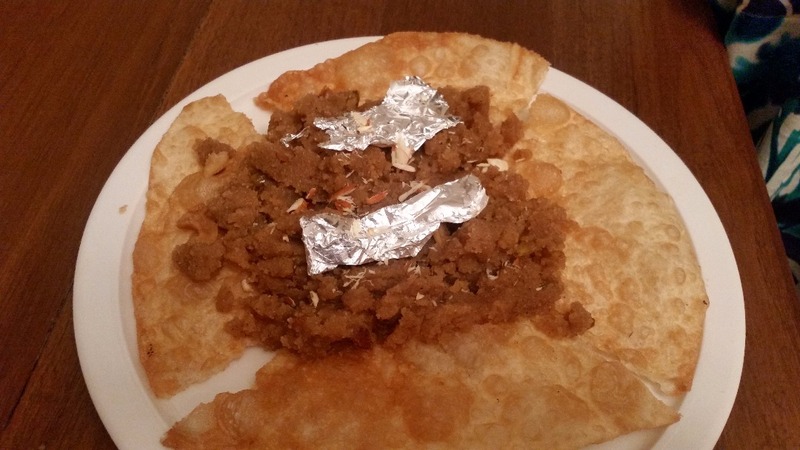 Halwa Poori, a pick from Punjab here is available by weight. Chef Khosla told us that the size of poori sold in Pakistan is huge, and it is then broken up and sold with sooji halwa. Leb-E-Shireen, again a dessert from Lahore had a custard kind of taste served with fruits and jelly. 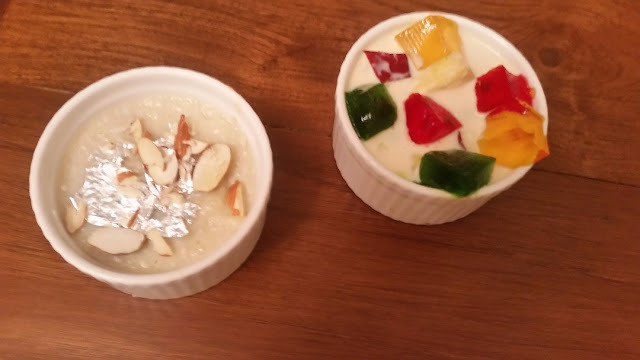 Gulathi, a rice and milk based preparation, was the third item served. 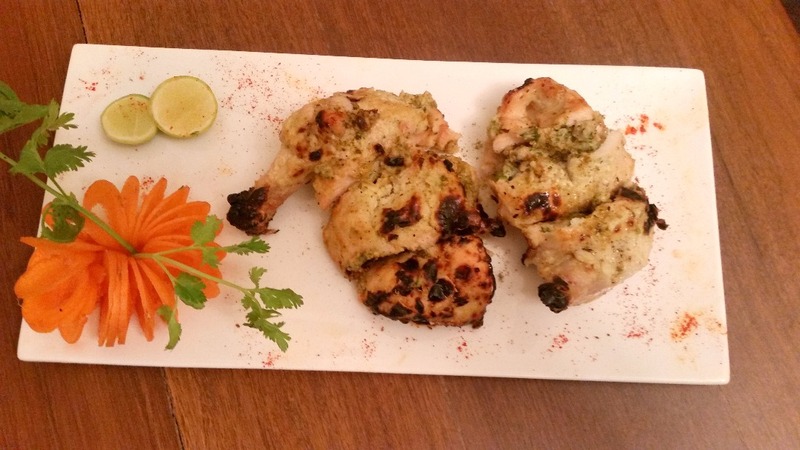 Kabab Stories is an exclusive place with special dishes which is only open in the evening. 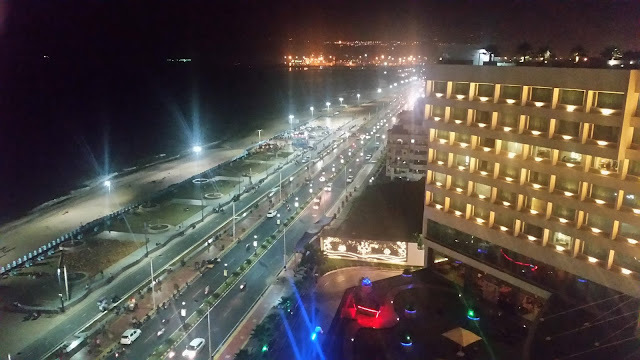 The menu is handpicked carefully and most of the dishes are exquisite. The restaurant has both al fresco and inside seating and can accommodate about sixty persons at a time. Some other items on the menu which I would look forward to trying on my next visit are Tandoori Raan Jhalfrezi, Mardani Mugh Khurchan, Alu Gosht Barra and of course the whole lamb Dum Dumba.